Last month, Netflix made the complete series of House, M.D. available for your viewing pleasure. So if you were caught up in a really good book between 2004 and 2012 or saw the title and thought this was some sort of DIY home improvement show, now’s the chance for you to retroactively find out what the fuss was about, as you stream the adventures of a cranky doctor who solves a nearly unending stream of complicated medical mysteries. Essentially, the show is what would happen if Sherlock Holmes had gone to medical school. By the principle of “things that sound sort of similar are the same thing,” Holmes becomes House, and Watson becomes his buddy Wilson. Instead of an inexplicable murder, there will be a patient with inexplicable symptoms, so House can try out a succession of unlikely theories until he solves the case at the last second. This is often accompanied by a thoughtful look, which is meant to indicate that House has done it again, by Jove! 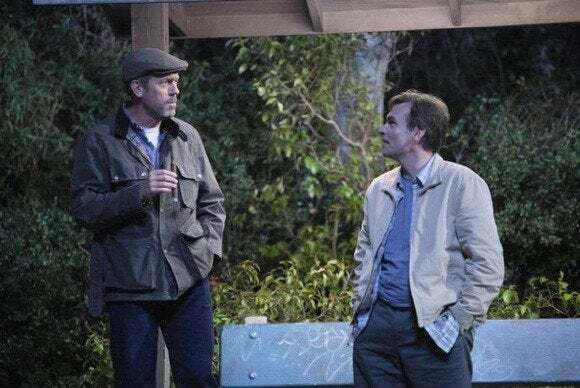 Hugh Laurie (left) as Dr. House and Robert Sean Leonard as the only character House doesn’t verbally abuse. Hugh Laurie plays Dr. Gregory House, a brilliant diagnostician who’s also a huge jerk. He eats Vicodin constantly because of a leg injury and also to provide an excuse for some of his more unacceptable behavior. He has a team of minions he berates, and a boss who also gets berated. His best friend is Dr. James Wilson (Robert Sean Leonard), who doesn’t get berated quite as much as everyone else. His minions change over the course of the series (because eight years is a long time), but they’re all reliably intelligent, though never quite as intelligent as House. It’s fun to see the parade of unlikely diseases that House has to grapple with. But the real draw is Hugh Laurie. Before House, he was mostly known as a comic actor in various British television shows, like Blackadder, Jeeves and Wooster, and A Bit of Fry and Laurie, frequently appearing with Stephen Fry. But when he was cast as Dr. House, he showed a surprising knack for drama—along with an even more surprising American accent—and got nominated for Emmy Awards for six of the show’s eight seasons. As played by Laurie, House can be rude and insulting but still charismatic enough that it’s easy to see why the other doctors not only put up with him but actually look up to him. And his relationship with Dr. Wilson is a delight, since Wilson is one of the few characters who gets treated mostly as an equal. Since House spends so much time being clever at other people’s expense, it’s refreshing to have the occasional scene where he’s willing to relax a bit. House found its formula early on in the series and rarely deviated from it. The patient is brought into the hospital, House probably refuses to see them in person, and he proceeds to make several incorrect diagnoses. Although House is a genius (as he and all the other characters remind us at every opportunity), he tends to make a few wrong guesses along the way, which usually involves dangerous treatments that almost kill the patient. (In fact, so many people suffer horrible setbacks while in the MRI machine that they should really just retire the thing.) And there are only so many mysterious diseases out there, which resulted in House’s team suggesting lupus for pretty much every case, even though it’s never, ever lupus. Ever. (It is lupus one time, though, but not any of the times it’s suggested.) House breaks hospital rules and actual laws fairly frequently, and although he does occasionally suffer some consequences, it’s hard not to root against him after being exposed to too many of his antics over a short time. House checks out a patient. I think we can rule out lupus. It’s also possible that the medicine employed in the show is not entirely plausible. If you’re an actual diagnostician, I imagine that House’s techniques will strike you as unusual and that his cases will be improbable. I’m only guessing, though, because to someone who is not medically trained, the actual medical lingo might as well be Star Trek characters discussing how to fix the latest problem with the warp drive. It’s great! House centers around an interesting protagonist who says witty things and solves seemingly impossible puzzles for the audience’s entertainment. And his supporting cast, while emphatically not House’s equals in terms of intellect or screen time, can usually be relied upon to entertain. Four. You don’t want to overdo a viewing session, but there are 177 episodes to see. If you set aside four hours a day to watch Hugh Laurie solve medical mysteries, you can get through the series in a little more than 30 days. When you’re done, you’ll have spent a solid month watching House, and then you’ll be well equipped to imagine that every little ache, pain, or sniffle that you have is symptomatic of something incredibly obscure and fatal. It makes even a common cold seem very exciting.